Designers Mary-Kate Olsen and Ashley Olsen spoke onstage at the 2014 CFDA fashion awards at Alice Tully Hall, Lincoln Center on June 2, 2014 in New York City. The Metropolitan Museum of Art devotes, until August 16, 2015, a room to four paintings by Vincent van Gogh. This may sound like a too small of an exhibition to go see but the opposite is true. The show is called "Van Gogh: Irises and Roses" and is well worth attending. I always appreciate an in-depth look into a painting. I like to learn about the painter's life and how a particular painting fits into it. I like to learn about the techniques used to create the art work. And, I like to learn about how the painting matters within the art world. When you step into the room at the Metropolitan Museum of Art, you will see two paintings of irises and two paintings of roses. And immediately you will pick up on the idea of a dialogue - a dialogue between art pieces and their color stories. Van Gogh painted these flowers with intent: he sought to impart a "calm, unremitting ardor" to his "last touch of the brush." Each ensemble has a horizontal and a vertical piece. One of the pieces shows the flower in full bloom; the other shows passage of time with a few leaves and blooms fallen off the stems. This exhibition reunites the four paintings for the first time since the artist's death and is timed to coincide with the blooming of the flowers that captured his attention. This study of Vincent van Gogh's love for flowers is a real treat for art lovers. Stop by if you have a chance! Tiny dancers. Smithsonian Folklife Festival. Washington D.C. June 2015. In my summer class, Textile Design, I learn about various techniques of developing fabric designs. I already shared with my adventures in monoprint and relief and block printing. This time, let's take a look about how China inspired by silk screen designs. To develop fabric patterns, one starts with inspiration. I researched China, its history and imagery. I came across beautiful paintings - I put the photos into my sketchbook and started drawing symbols and objects inspired by what I saw in the photos. As you can see below, my first silk screening design is of birds. I found that traditional Chinese painting portray nature - flowers, trees, and birds. I sketched a simplified/abstracted version of the birds and made a stencil for my silk screen design for a 100% cotton fabric. I show you the process of stencil creation in my bamboo-inspired design. Architecture - houses, palaces, pagodas - is another topic frequently represented in Chinese imagery. So, I created a stencil of a pagoda reflecting itself in water. The final symbol is lovely and could be used to develop many variations of a fabric pattern. And final, China is famous for its calligraphy and intricate symbols. I sketched options in my sketchbook and then created two templates - one to be printed in red; one in black. The symbols are abstract, yet they tie nicely to the inspiration for my work. I have very much enjoyed learning about silk screening and using Chinese imagery to develop my fabric designs and patterns. I am looking forward to learning more! The National Gallery of Art Celebrates 25 Years of Photography with "In Light of the Past"
Hurry! A spectacular photography exhibition is closing this Sunday, July 26, 2015, at the National Gallery of Art in Washington D.C. If you have a chance, stop by to visit "In Light of the Past: Twenty-Five Years of Photography at the National Gallery of Art" in the West Building Ground Floor Galleries. Photography, as an art form, has been making an impact on the art world from its birth. This exhibition traces its development through 175 masterpieces all the way to the end of the 20th century. As you stroll through the exhibition halls, you will find wonderful examples of 1920s and 1930s modernism as well as mid-20th century American photography. The collection is rich in topics, points of view, and artistic angle. Take a look at the three examples below and put this show on your calendar before it closes this Sunday! Gift of Mary and Dan Solomon and Patrons' Permanent Fund, 2006. Solitary cloud. Gaithersburg, Maryland. May 2015. Frank Lloyd Wright (FLW) may be most known for Fallingwater or the Guggenheim Museum, but I personally prefer his smaller and more modest architectural endeavors. My favorite is the Pope-Leighey House in Alexandria, Virginia. My favorite ... indeed, as I have visited it on three different occasions! And I would go back again. The residence has had two private owners: the Popes and the Leigheys. Hence, the name of the house as we know it today. The Popes commissioned the house and worked closely with FLW to design a simple yet truly spectacular residence. Why do I like it so much? As you can see from the photos in this blog, the house is a built with combination of wood (non-weight bearing sections of the house) and brick (weight bearing sections). It is a clever way of construction. Wood is cheaper than brick - hence, FLW used it strategically through the house. The outside gives a sense of privacy but as you walk around, you will come across large windows and a warm welcoming feeling. FLW employed a strategy of contrasts on the interior as well. Narrow entry way opens up to a living room, dining room, and kitchen - all of the space is open without walls. Yet, one gets a clear sense of what each section of the house is to be used for. For instance, the ceiling in the dining room is lowered almost forcing the inhabitant to sit down and enjoy a meal. The ceiling in the living room is higher - one can imagine the family spending time there or entertaining a party of friends. What strikes me as particularly appealing is the emphasis on horizontal lines. On the outside, we see long panels of wood - our eyes slide across the surface getting an impression of length and open space. There is no basement and no upper floor in the house - the house is part of the landscape. It is just like another layer (line) above the ground. The interior is the same - the vertical divisions between bricks are blocked while the horizontal divisions are highlighted with the use of lighter color. If you have a chance, make a trip to see the house and tour it with an experienced guide. They will provide much more detail about this FLW masterpiece. Guided tours of the Pope-Leighey House are offered Friday through Monday, and run every half-hour, from noon until 4pm. Scroll down to see more photos of the house. Calligraphy as a Graphic Element in Fashions at "China: Through the Looking Glass"
The Metropolitan Museum of Art in New York City is hosting an extensive exhibition called "China: Through the Looking Glass." I have written a series of three blogs focusing on this show's fashion-related topics. This time, let's take a look at the role of Chinese calligraphy in fashions by Western designers. Fashion designers have long been fascinated by the intricacy and beauty of Chinese language and calligraphy. They often look at the patterns created with the characters as well as ways to incorporate each character's meaning into design. In China, calligraphy is considered the highest form of artistic expression. It is indeed an art to treat each character with attention and patience to draw it properly and beautifully. There are two lovely examples of how Western designers incorporated calligraphy into their fashions. 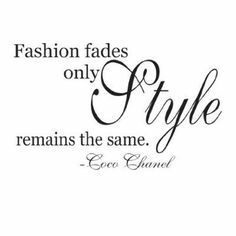 Both Christian Dior and Gabrielle "Coco" Chanel used Chinese characters as textile patterns. The dress on the left feels breezy with a lot of white space between the characters; the dress on the right uses the characters in a more dense way filling up most of the fabric's surface. Interestingly, it seems that Dior was unaware of the the semantic value of the words on his dress. As the exhibition's page highlights, this "has resulted in a surprising and humorous juxtaposition. The dress is adorned with characters from an eighth-century letter by Zhang Xu in which the author complains about a painful stomach ache." As it turns out language and calligraphy can be both a source of understanding and learning and a source of confusion and misunderstanding. If you have a chance to see the exhibition, see for yourself how you feel about the designs on display and how Western designers interpret the culture of China. Blog 2 - Warrior Culture in Fashions at "China: Through the Looking Glass"
Artist at work. Smithsonian Folklife Festival. Washington D.C. June 2015. I recently designed and sewed a black and white dress that plays with the idea of optical illusion. 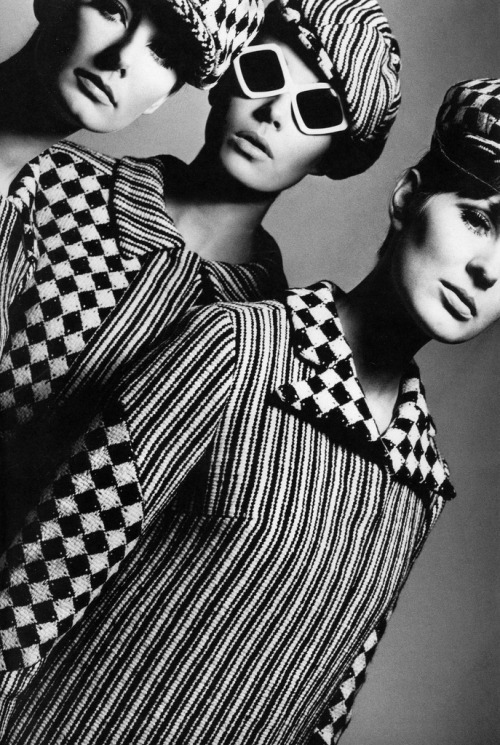 Op Art - a 1960s art movement - is still prevalent and popular with fashion designers around the world. In the early 1960s, Bridget Riley, a British painter, began her first Op Art paintings, working only in black and white and using simple geometric shapes – squares, lines and ovals. 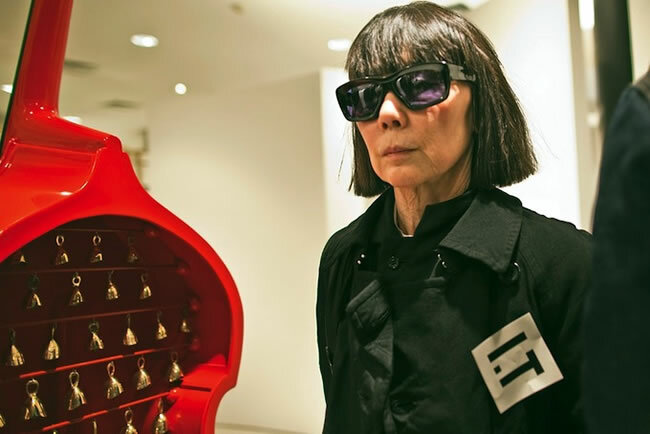 The 1965 exhibition "The Responsive Eye" in New York showcased her work kicking off her fame. 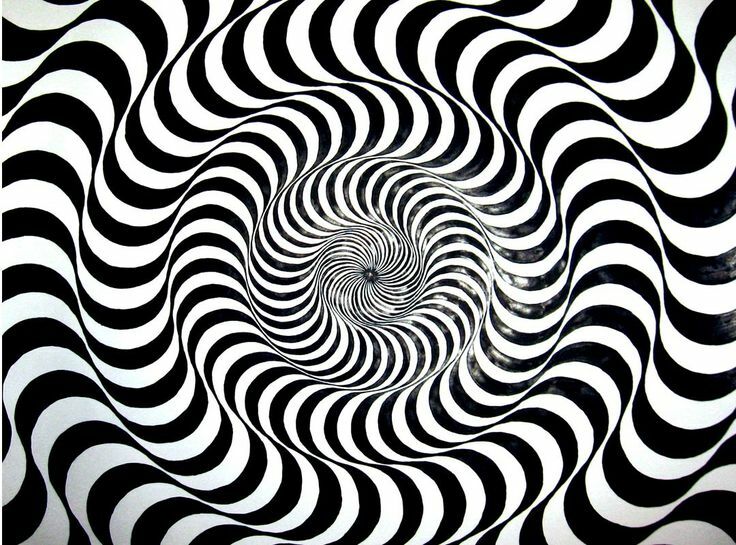 It was around this time that the term ‘Op Art’ entered the public consciousness. The fashion, design and advertising industries fell in love with its graphic, sign-like patterns and decorative value. Op Art was cool, and Bridget Riley became Great Britain’s number one art celebrity. 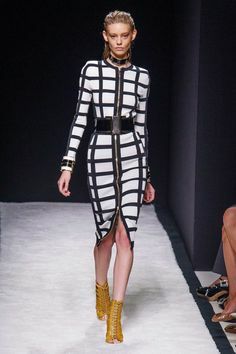 Below you can see Op Art designs on the runways last and this year. Still so popular! Still so intriguing! 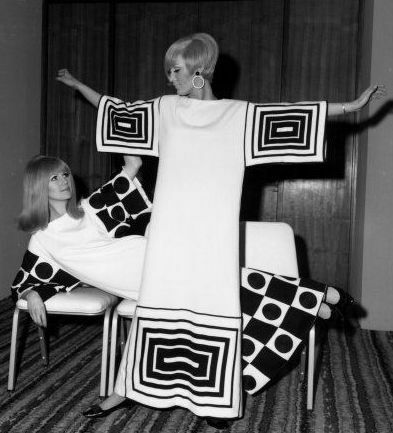 While the designers are working with contemporary silhouettes, they are also honoring the strong heritage of the 1960s fashions and Op Art patterns. I am certainly glad to understand the history behind the pattern in my own design. And I am also glad to see the strong tie between art and fashion. The Freer Gallery in Washington D.C. has a small yet truly significant exhibition on show called "Fine Impressions: Whistler, Freer, and Venice." Housed in one room, this exhibition is an in-depth study of James McNeill Whistler's Second Venice Set. It is a set of 26 etchings. Freer, the museum founder, purchased the whole set on a trip to a New York city art gallery. He was not impressed with Whistler; his works were not among his earliest acquisitions. Yet, with Second Venice Set, Freer could not resist. As the museum's webpage highlights: "Freer leaped from his chair and paced around the room 'uttering large adjectives'" when Whistler's etchings were presented to him. Like Freer, I very much enjoyed seeing the art works on display. They are moderately sized and the exhibition feels intimate - one needs to get close to the prints to truly appreciate the workmanship. The pieces are striking - despite the limited color scheme of print making, they present light, ambiance, and texture. And they show scenes from Venice, one of my favorite travel destination. Freer and Whistler developed a friendship that enriched them personally but ultimately led to an amazing collection of art pieces that one can now enjoy as part of the Smithsonian collections. "Fine Impressions: Whistler, Freer, and Venice" is on display through January 3, 2016 at Freer Gallery (ground floor). Fields and forests in Sharpsburg, Maryland. June 2015. I grew up being surrounded by porcelain. My grandmother had a beautiful Blue Onion set by Meissen. So, when I saw the traditional Chinese blue-and-white ceramics on display at "China: Through the Looking Glass", I was taken back to my childhood memories of lunches and afternoon teas. In my previous blogs about this exhibition, I highlighted Guo Pei and the Chinese culture of wuxia. Western designers, as we will learn in this blog, have appreciated the intricate pattern of the traditional porcelain designs. The history of porcelain exchange is more than just a history of business between East and West. It is primarily about cultural exchange - while it was developed in China in the 13th century, it has influenced potters in the Netherlands, Germany, and England. The designs in this gallery showcase garments by Western designers who incorporated the porcelain patterns in the fabric imprints. The silhouettes are mostly Western and familiar to the Western customer. We can admire corset-like tops, over-sized skirts, and halter tops. The design in the bottom right photo is by Guo Pei, who draws both on her Chinese heritage and her extensive knowledge of the Western culture. Her golden dress has a whole gallery devote to it. Her blue-and-white gown is exquisite. Relief and Block Printing: What an Exciting World of Creativity! I continue to enjoy my Textile Design class! And I am happy to share two new techniques I just learned: relief and block printing. My class project has a theme and that is to chose a culture/country and generate fabric patterns and designs that draw on this country and its heritage. I choose to research China, the traditional paintings, and its landscape. I studied the most popular colors and textures found in traditional Chinese fabrics. Once I gathered sufficient visuals, I sketched several ideas in my sketchbook. Then, I create a relief - a stamp made out of cardboard and Styrofoam. For this relief, I decided to go with geometric shapes I located in common fabrics. Below you can see how I combined a total of four stamps into various pattern options. Keeping with China as the inspiration for my work, I also created a block. Chinese paintings often depict flowers, trees, and birds. I located a lovely painting of flowers that I ended up carving into a linoleum block. I then printed the block on paper and manipulated the imprint in the computer. Et voila, see all of the options I came up with! I am looking forward to learning new techniques. I will keep you posted of my progress. Have you ever tried relief or block printing? Let me know!